PARTICIPATE IN SONOMA VALLEY DELICIOUS! Sonoma Valley culinary businesses (restaurants, wineries, tours, farmers, food producers...) are encouraged to submit an offer, event or program and take advantage of the free marketing during the off-season. Sample ideas include a signature dish with a story (your Grandmother&apos;s lasagna), a tour of your kitchen and a cooking class, a chef&apos;s table, a hands-on experience or a meet the maker (food maker that is) event. The options are up to you. 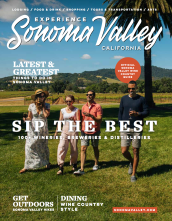 Visit California, the state tourism agency, and Experience Sonoma Valley are heavily promoting Sonoma Valley Delicious through marketing and PR. If you aren&apos;t a part of Delicious, you will miss out. Send us a photo as well! Submit your Sonoma Valley Delicious item to David Wells davidwells@sonomavalley.com or fill out the form below.